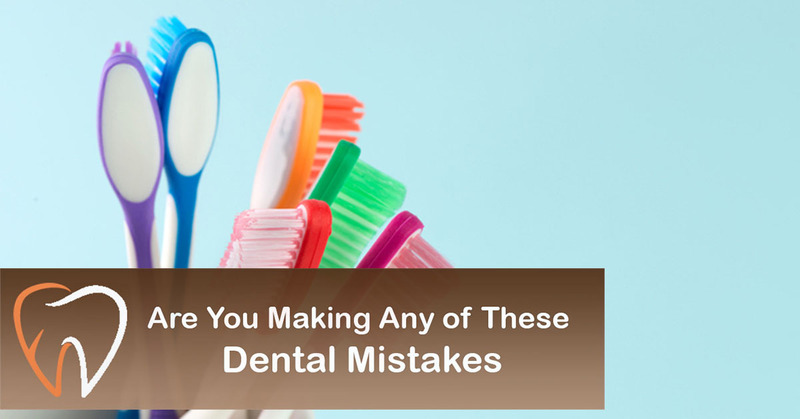 Are You Making Any of These Dental Mistakes? Brush. Spit. Rinse. Do this twice a day, and your teeth and gums will be in tip-top shape, right? Brushing your teeth is a great habit to have, but there is much more to keeping your mouth clean. The truth is, most of us probably make at least one mistake when it comes to maintaining good dental health. Here are the top five mistakes we at Enamel Dental see our patients making, along with some tips to make it right! Flossing improperly. All kinds of products have emerged on the market to help with flossing, from picks to water flossers. But in our view, the most effective is good old-fashioned floss. For proper technique, use about 18 inches of floss. Wind each end of the floss around each middle finger, leaving a few inches of floss to work on your teeth. Hold the floss between your thumbs and forefingers. Gently glide the floss up and down between your teeth. At the gum line, curve the floss and gently slide it along the base of the tooth. Use clean sections of floss as you move along. Not coming to the dentist every six months. Life gets busy, you forget to make an appointment, and before you know it, months went by. It is helpful to make your next appointment at the end of your dental visit while you are still in the office, and set a reminder on your calendar. Many dentist’s offices are good about calling or sending a reminder text when the appointment date draws near. Waiting until a tooth hurts to treat it. Pain is not the only indicator of a problem with your teeth. If you experience mild discomfort, consult your dentist to evaluate the problem. And if your dentist recommends a filling during a check-up, take the dentist’s advice, even if you do not feel pain. If you wait until a problem worsens, it could be more complicated and costly to treat. Snacking often. It stands to reason that the more you eat, the longer food stays on your teeth. If you are a frequent snacker, avoid sticky, sugary foods such as caramels or hard candies, gummy snacks and dried fruit. It is also good to limit acidic foods and beverages, which tend to wear down enamel, and starchy foods like potato chips, because starch tends to linger on your teeth. If you do eat these foods, drink plenty of water to wash away food residue, and brush your teeth after your snack, if possible. Consider keeping a toothbrush and some travel-size toothpaste in your bag or in your desk at work. Brushing too hard or using a toothbrush with hard bristles. There is no benefit to brushing aggressively. In fact, it can actually be harmful. Over-brushing wears down enamel and can push back the gums, causing exposure to the sensitive area beneath. Use a brush with soft bristles to gently brush teeth with short strokes, rather than scrubbing back and forth. If you feel the bristles bending, you are brushing too hard.